Hotel Victoria is located at 26 Seifertova in Prague. The underground Hlavni nadrazi station is just 10 minutes drive from this property. Wenceslas Square is one of the major city squares and the centre of the business and cultural communities can be explored. 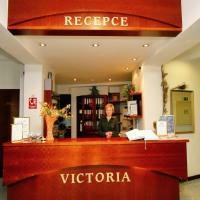 Hotel Victoria features 42 tastefully furnished rooms. Each unit is designed with trendy decor. The room amenities include satellite TV, telephone, Internet access, mini bar and in-room safe. The onsite restaurant at this property serves delicious buffet breakfast. Lunch and dinner is also served at the restaurant. The lobby bar serves an array of drinks.